Oh man. Those eyes. I would imagine that's what just about everyone says when they meet little Miss Juliette. 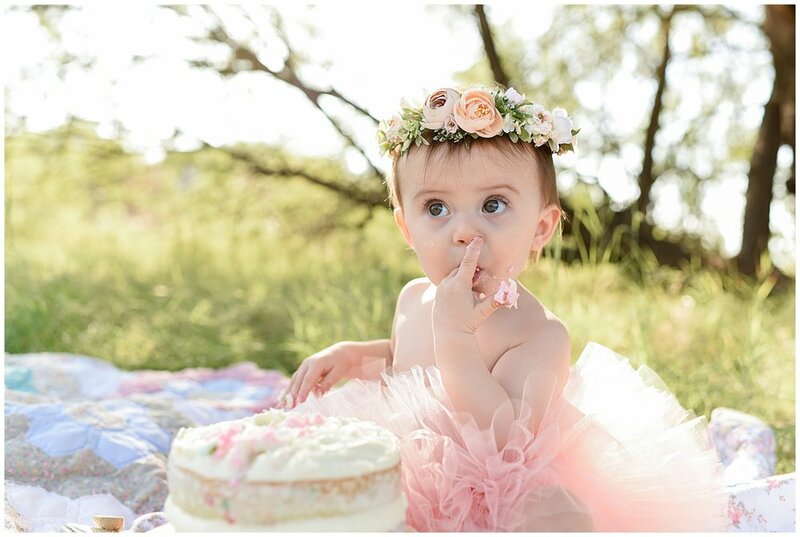 Juliette and her lovely family met me one morning for her First Birthday Cake Smash photo session. 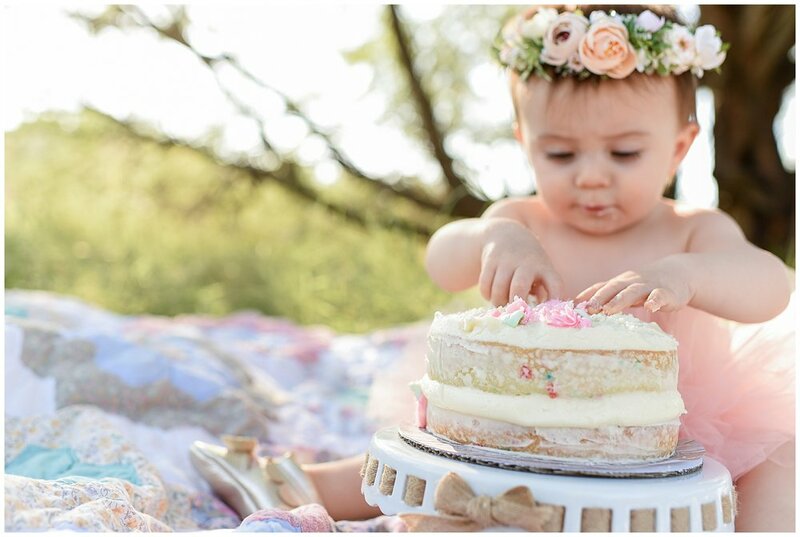 It was a group effort to plan sweet "Jett's" (as they lovingly nicknamed her) cake smash session. 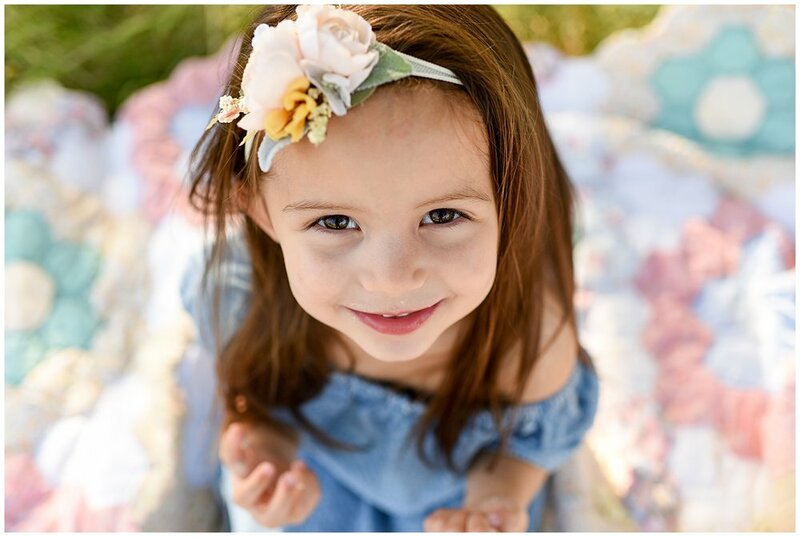 Her mama and I joined forces to create a "vintage whimsy" photoshoot. 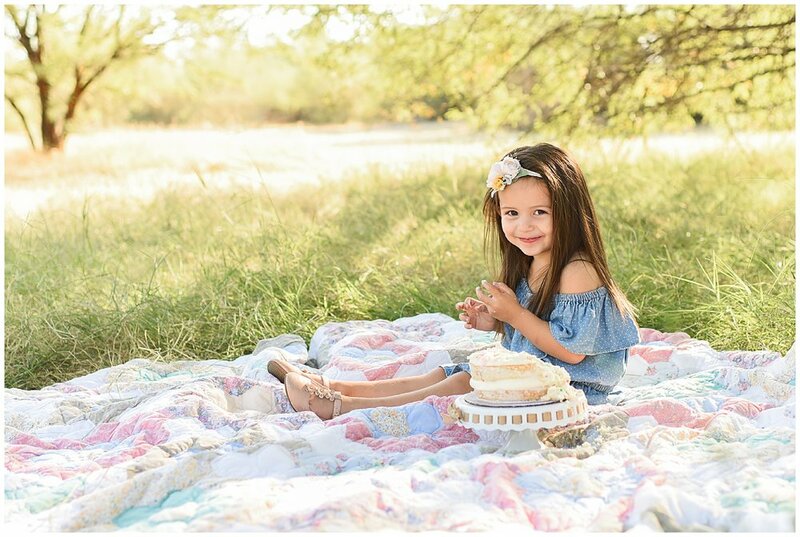 The vintage unicorn outfit, floral crowns and darling purple berry metallic faux leather bow by Sweet P Jolie paired with my antique child's rocking chair, quilt and the field location... we, in fact, nailed it! Big sister showed up to the shoot well aware that this photo session with for her sissy. She seemed a little blue until I asked her if she'd like be in front of my camera. Lights. Camera. Cuteness. TIMES TWO! 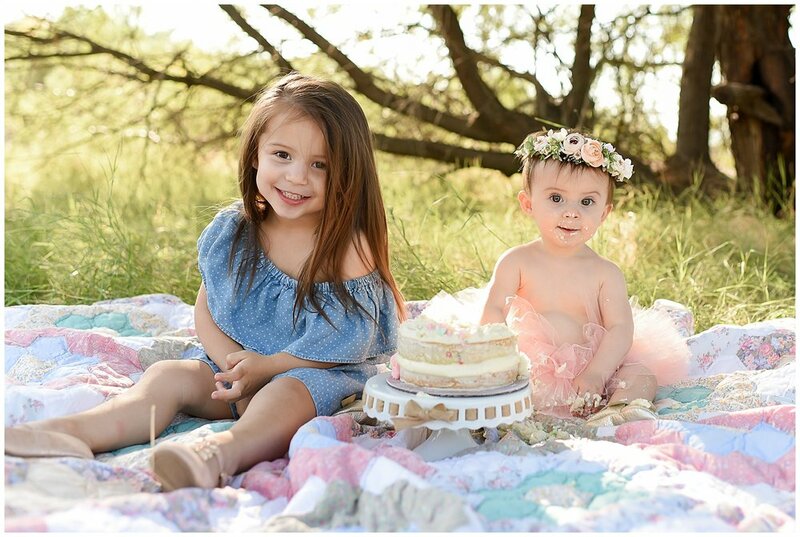 These girls surpassed any expectation I had for this shoot. 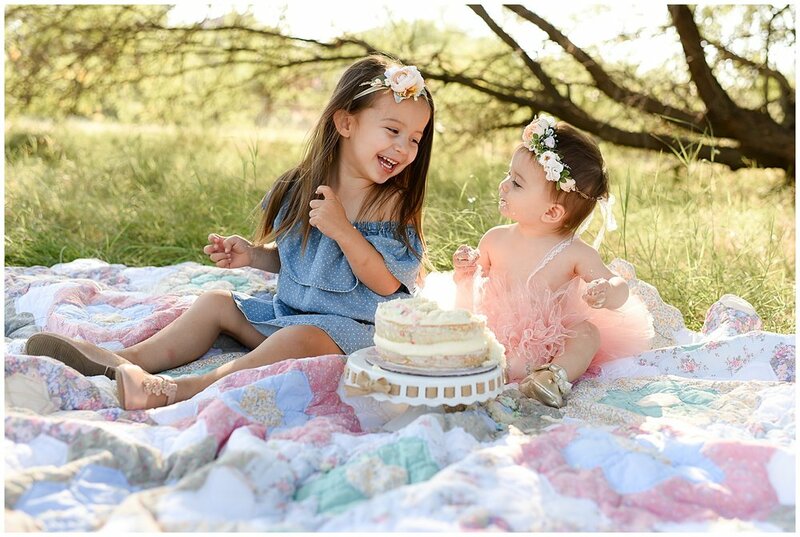 Not only did they look adorable and coordinate perfectly, but they were truly sweet sisters. Big sis took care of little sis. Little sis adoringly watched everything big sis did and mimicked it. Then when it came time to smash the cake, Mom and dad asked big sis to give baby sister some space to do her thing. Sweetly, big sis stepped aside. Out of the corner of my eye I could see her little heart breaking. She wanted back in the picture. Bad. After I captured an insane amount of darling shots of the birthday girl, I asked mom if it was ok to invite big sis back into the set. 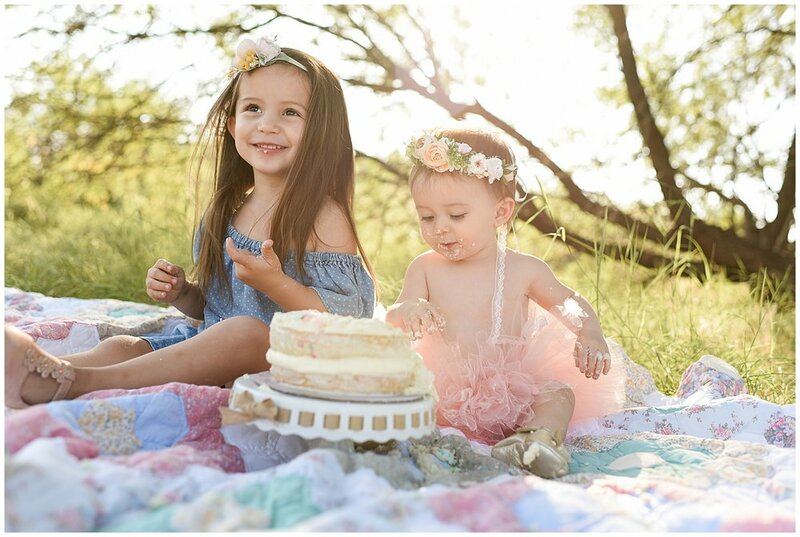 Well, you can see how delighted she was to assist in the smashing of her sister's birthday cake.